Bobby Bare is one of country music’s most unique artists, with a laid-back vocal style and a free, creative approach that he has used for traditional country ballads, rowdy rockers, folk-story songs, and even children’s tunes. Between 1962 and 1983, he charted almost five dozen top-40 country hits. Since then, he has continued to record a variety of compelling material and perform live shows across the nation. Robert Joseph Bare was born on April 7, 1935, in Ironton, a river town in far southern Ohio. His mother died when he was five years old. His father was unable to care for him and his two sisters, so the younger sister was given up for adoption and the older sister was sent to live with relatives. Young Bobby stayed mostly with his dad, growing up on a farm. He developed an early interest in music and made a crude guitar out of a coffee can, a stick, and screen wires, using his imagination to improve the sound. Bobby’s musical tastes were not limited to country music. Besides listening to the Grand Ole Opry on the radio, he also enjoyed listening to big band music and rhythm and blues. In his early teens, Bobby left home because he didn’t get along with his stepmother, and he went to live with different relatives. He also formed his first band (with a real guitar by this time). His group got a job performing on a radio program that was broadcast in the area around Springfield, Ohio. Later, in the early 1950s, he performed on a bigger radio program based in Wilston, Ohio. Bobby Bare singing with Willie Nelson and bluegrass great Mac Wiseman. All three are now members of the Country Music Hall of Fame. In 1953, Bare got a ride to California, playing music to earn tips to pay for gas. His driver said that he knew two famous country instrumentalists there, and he really did. He introduced them to Bare. One of the instrumentalists, a steel guitarist and record producer named Speedy West, hired Bare to write songs and helped him get a record deal with Capital. Bare had little luck with his recordings there, or with his next label, Challenge. He found more success playing in nightclubs in California—until he was drafted into the Army. In 1959, while in Ohio waiting to get inducted into the Army, Bare recorded a demo of a self-penned song about his induction, called “The All-American Boy,” for Fraternity Records. The demo was released, under the name of Bare’s friend Bill Parsons, and reached number two on the pop charts. After getting discharged from his two years in the service, Bare recorded without success for Fraternity for a short while before getting signed by Chet Atkins at RCA in Nashville in 1962. There, he soon scored two hits with “Shame On Me” and “Detroit City.” The latter song was his first top-10 country hit, and it won a Grammy Award for best country and western recording. These early songs had something of a country-folk feel to them. During the rest of the 1960s, Bare had additional hits with “500 Miles Away From Home,” “Miller’s Cave,” “Four Strong Winds,” “The Streets of Baltimore,” and “(Margie’s at) The Lincoln Park Inn.” The latter song, written by Bare’s former bass player Tom T. Hall, was controversial because of its frank presentation of adultery. In 1965, Bare used his success and influence at RCA to help get his friend, Arizona-based singer Waylon Jennings, signed by the label. In 1970, Bare moved to Mercury Records. At that label, he began to record a series of albums featuring songs written by the most creative and original young writers of the day, such as Hall, Kris Kristofferson, Mickey Newberry, Billy Joe Shaver, and Shel Silverstein. In 1973—back at RCA—Bare recorded and self-produced the album Ride Me Down Easy (titled from the Shaver song). That album set the precedent of artistic control that other artists, particularly Waylon Jennings, would take and craft into the outlaw country-music movement. Also in 1973, Bare released a double album of mostly Silverstein songs titled Lullabys, Legends & Lies. That concept album included a couple songs featuring the vocals of Bare’s five-year-old son Bobby Jr, including “Daddy What If” and the funky “Marie Laveau” (Bare’s only number-one song). Another album of mostly Silverstein songs, recorded with Bare’s whole family, was released in 1975, titled Singin’ in the Kitchen. That album yielded a big hit with the title song. Additional Silverstein songs with which Bare had hits included “The Winner” and “Drop Kick Me, Jesus (Through the Goalposts of Life).” Other hits during the 1970s included “Sleep Tight, Good Night Man,” “Numbers,” and “No Memories Hangin’ Around” (a duet with Roseanne Cash). Although not usually associated with the “outlaw” country music of the 1970s (to the same extent as Jennings and Willie Nelson), Bare was actually much in tune with the outlaw philosophy. In fact, he fought for the right to record in his own way long before Waylon and Willie did the same. Bare recorded albums in his own unique style, often using unusual instrumentation and material by non-country artists, such as Bob Dylan and the Rolling Stones. His songs received quite a bit of airway on FM rock radio. 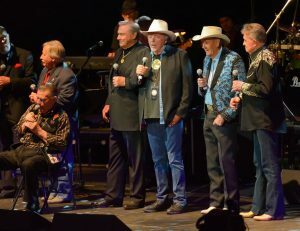 Bobby Bare on stage at the George Jones Tribute Concert along with Stonewall Jackson, John Conlee, Jim Ed Brown, Bobby, Jimmy C. Newman and the great “Whispering Bill” Anderson. 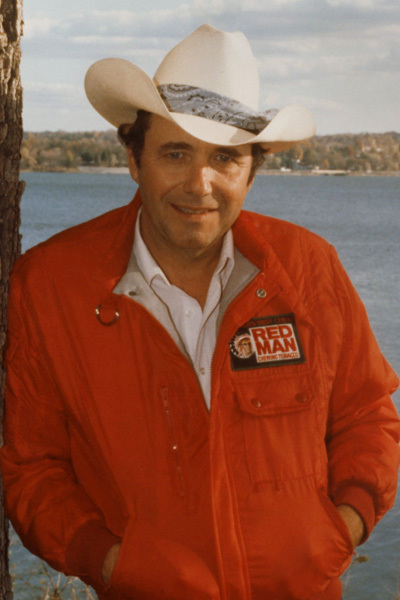 From 1983 to 1988, Bare hosted his own music talk show on TNN titled Bobby Bare and Friends. The popular show focused on interviews with songwriters. In 1998, Bare recorded an album of Silverstein songs titled Old Dogs with his friends Jennings, Jerry Reed, and Mel Tillis. Most of the songs focused on the idea of aging. Waylon Jennings singing “Rough on the Living” from the album Old Dogs, with Bare, Jerry Reed, and Mel Tillis. 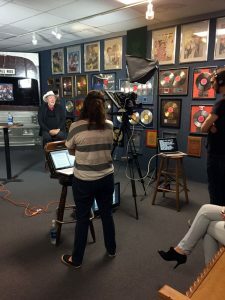 Bobby Bare taping a TV show interview at the Willie Nelson and Friends Museum. The album Things Change, a collection of country songs featuring a duet with Chris Stapleton on a new version of Bare’s classic “Detroit City,” was released in 2017. This album also includes “Trophy Girl,” the last song written by much-admired Texas songsmith Guy Clark. 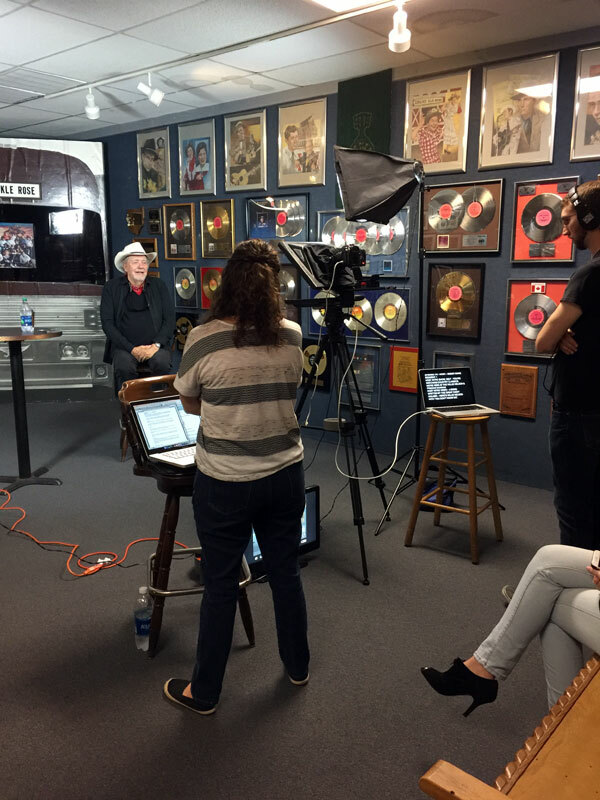 Bobby recently stopped by the Willie Nelson and Friends Museum recently to do a TV interview in support of the release of this great new CD. Everyone had a great time that day and many customers were not only surprised, but very happy to got to meet the great Hall of Famer. Bobby is not only a great talent but a very nice and funny guy who is a joy to be around. 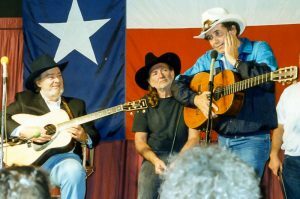 Bobby Bare was elected into the Country Music Hall of Fame in 2013 and continues making great music and of course, fishing… Bobby also sometimes joins his son, Bobby Bare Jr, on the younger Bare’s alternative rock/country albums. Bobby Bare’s official website, his Country Music Hall of Fame induction and his discography.